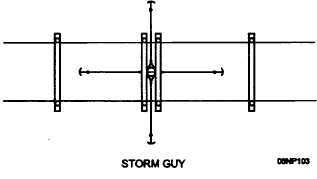 Home > Construction Training Manuals > Construction Electrician Basic > Figure 4-6.Storm Guy. the rod and anchor installed in the ground (fig. 4-2). This type of guy is preferable if field conditions permit its installation since it transfers the unbalanced force on a pole or structure to the earth without intermediate supports. 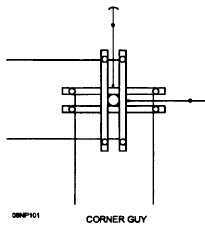 A down guy used at the ends of pole lines to counterbalance the pull of the line conductors is called a "terminal guy" or a "dead-end guy" (fig. 4-3). All corners in the line are considered as dead ends. They should be guyed the same as terminal poles, except that there will be two guys, one for the pull of the conductor in each direction (fig. 4-4). Figure 4-4. - Corner guy. SIDE GUY. - When the line makes an angle, a side pull is produced on the pole. 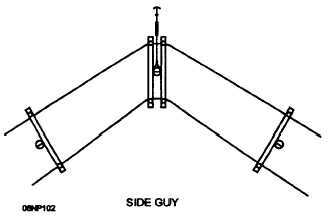 Side guys should be installed to balance the side pull (fig. 4-5). When a branch line takes off from the main line, an unbalanced side pull is produced. A side guy should be placed on the pole directly opposite to the pull of the branch line. Figure 4-5. - Side guy. STORM GUY. - Guys are installed at regular intervals in transmission lines that extend long distances in one direction to protect the line from excessive damage as a result of broken conductors. Guys installed to protect the facilities and limit the damage if a conductor breaks are called "line guys" or "storm guys" (fig. 4-6). Figure 4-6. - Storm guy. SIDEWALK GUY. 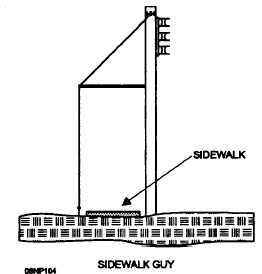 - An anchor guy with a horizontal strut at a height above the sidewalk to clear the pedestrians on the sidewalk is referred to as a "sidewalk guy" (fig. 4-7). SPAN GUY. - A span, or overhead, guy consists of a guy wire installed from the top of a pole to the top of an adjacent pole to remove the strain from the line conductors. The span, or overhead, guy transfers the strain on a pole to another structure. This may be to another line pole or to a stub pole on which there is no energizer equipment. A span guy is always installed to extend from the strain pole to the same or lower level on the next line pole. Figure 4-7. - Sidewalk guy.